On gorgeous days like today, I like to spend as much time outdoors as possible. But, I’ve been wanting to try this experiment and I knew it would be a fast one. It’s so easy. 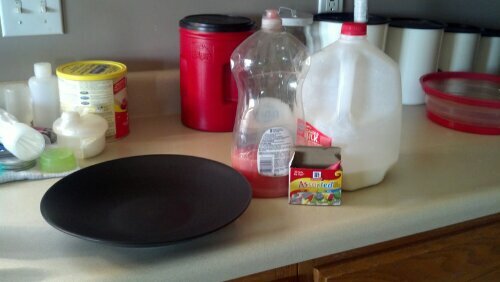 All you need is milk (I read that anything 2% or higher is best), dish soap, a plate and food coloring. 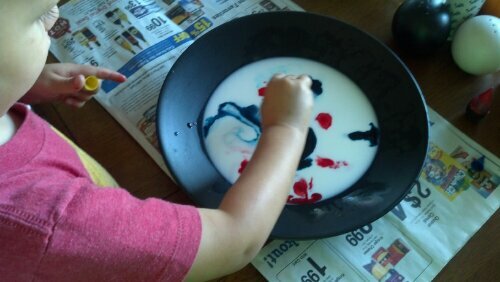 First, pour a layer of milk on the plate and dot with food coloring. This step was a bit challenging for Joe because if he had his way, he’d squeeze all the food coloring out in one spot. Once he saw how much fun it was to squeeze little dots of color all over the milk while making the “doop, doop, doop” sound, he was unstoppable. No really, I practically had to wrestle the red away from him. When you have all the dots where you want them, squeeze one drop of dish soap in the middle and watch. 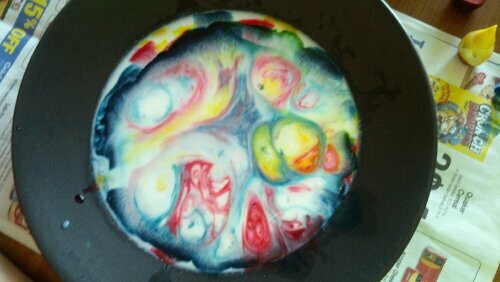 The colors start to whirl and swirl and mix. It’s one of the coolest experiments we’ve done. That tiny drop of dish soap starts to break down the bonds that hold the proteins and fats in the milk. The watery part of the soap dissolves in water, and the sudsy-soapy part attaches to the fat globs in the milk. 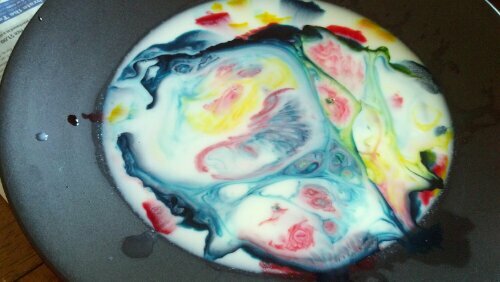 As the fat globs bend and twist, twirling the colors all around the milk, the sudsy bits race around trying to catch up…bending the colors every which way and making a pretty rainbow explosion on the plate. We tried adding another drop when all the colors stopped moving but nothing happened so the soap must have mixed itself up with the milk. 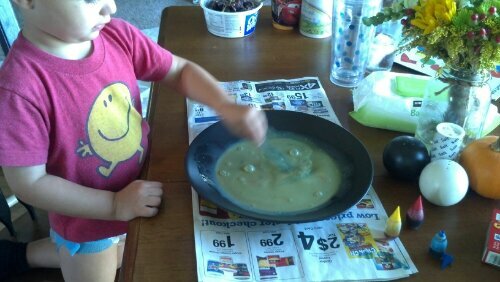 Joe wanted to play a little more so I gave him a popsicle stick and he stirred it all up making this sludge that looks like pea soup. Joe and I both really enjoyed this “speriment”! The science behind it was a little lost on him…he was more interested in why all the colors were gone after he had stirred it up. I used the question as an opportunity to tell him about what happens when you mix a bunch of different colors together. He looked at me for a moment and then asked if he could have a drink of milk.